It’s been a long time since I’ve posted. I think I always say that–or at least I seem to be saying that a lot in the recent past. After spending all day long at a computer for my day job, it’s hard to want to hop on the computer at home, even if it is for something really cool like sharing my art on this blog. What can I say? 2011 was a doosie and I’m sort of glad to see it go. Not that life magically changes or gets easier when the calendar resets to January 1st, but I’m letting bygones be bygones. Water under the bridge, you know? 2012 is all about balance for me–at least that’s the theme that I see emerging in the 19 days so far. With that in mind (and a gut instinct that the theme was balance–of life, of activities, of time, of mind), I started this piece on New Year’s Day. It’s big–the base is a repurposed door that I got off of Craigslist. Now, I need to get a good full body shot to post! It’s been fun to play with greens and browns…not my usual go to color scheme, but it seemed fitting for a tree. I have a few ideas in mind for her background, but I haven’t decided on one yet…so I will save that for later. 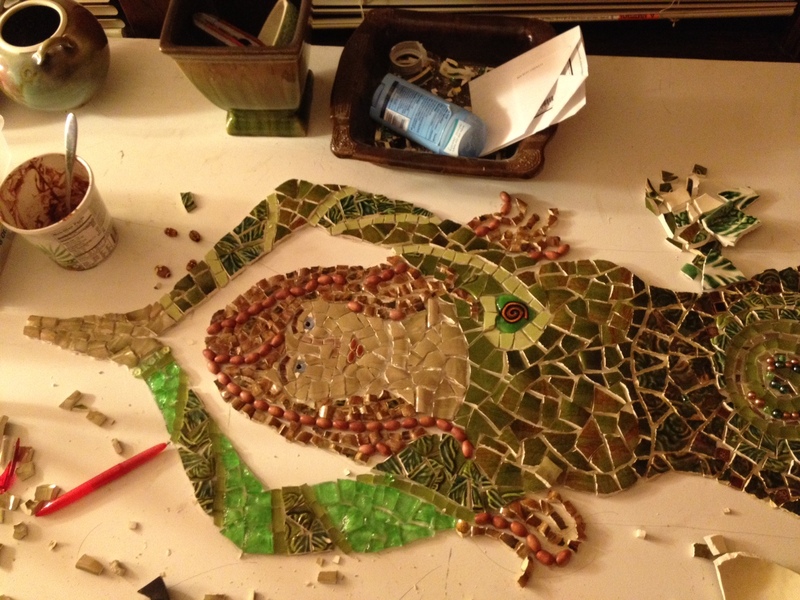 There are a bunch of other pieces that I’ve been working on–and some that are even grouted now! I will see about getting pictures tonight so that I can post them here. Here’s to a happy and balanced 2012. May it be your best year yet! 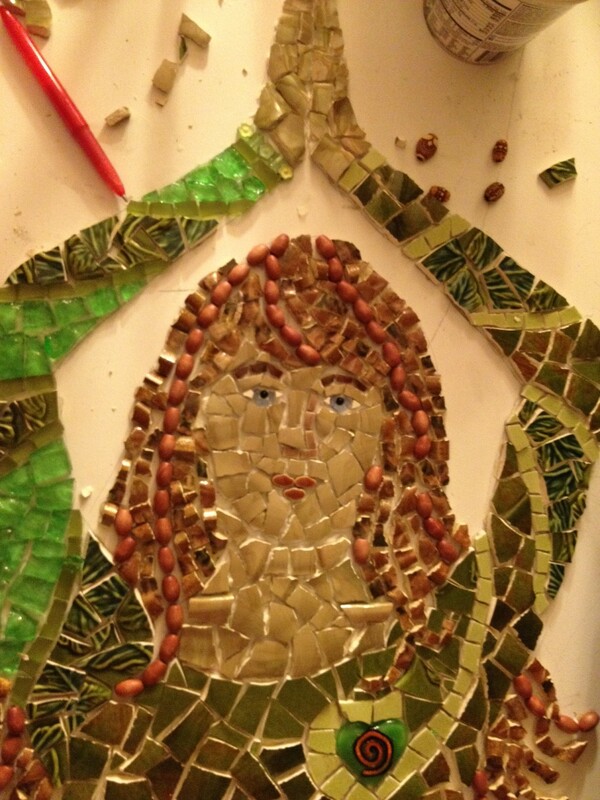 This entry was posted in Mosaic Musings, Uncategorized, Work in Progress and tagged tree, yoga. Bookmark the permalink. Oh my goodness, thats beautiful!. I would love to think “i could do that”, but I would only copy ( and not as well ) your wonderful piece. I dont have the ability to ‘see’ something that isnt there yet. Wonderful wonderful wonderful. I hope you dont mind but I plan to share it.